A new series of US documentary stamps began appearing in 1940. These new stamps were all engraved, perforated 11 or perforated 12, watermarked USIR, and all the denominations are printed in carmine (varying shades). 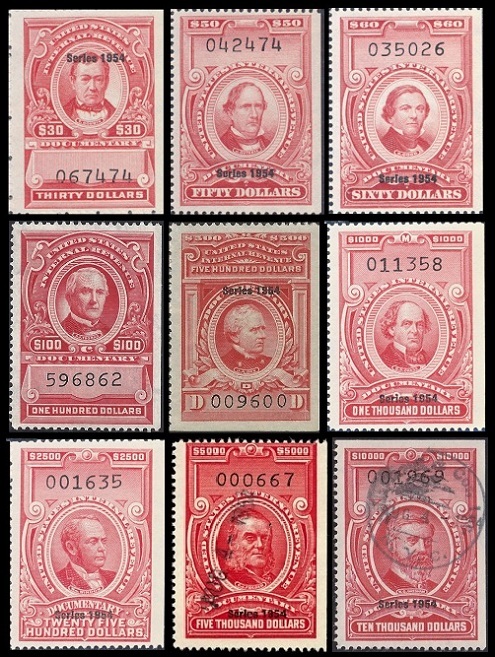 US revenue philatelists refer to these issues as the "REDS". As would seem appropriate for US revenue stamps, these new stamps feature the portraits of former Secretaries of the Treasury. Various denominations of these documentary stamps were issued every year between 1940 and 1958. Each year, with only a couple exceptions, the documentary stamps were overprinted with "Series" and the current year date. During this period 445 different documentary stamps, as listed in the Scott catalog, were issued, and this number only accounts for the major varieties. In order to make the review of these documentary stamps easier to digest, webpage-wise, I have broken them down into three different groups, separated by denomination ranges. In order to illustrate ALL the denominations of the documentary stamps that were issued during the lifetime of this series, I have selected the 1954 set for my images. During 1954, the 1 Cent through 20 Dollar documentary stamp denominations were NOT OVERPRINTED, as these particular stamps were used until the series was retired. The 30 Dollar through 10,000 Dollar denominations are all OVERPRINTED "Series 1954". Following the illustrations for each of these denomination groups, there will be a line indicating the year of issue, the overprint, and then a detail section with a brief description of the denominations issued during that year. The description detail for each denomination will appear ONLY ONCE. Subsequent detail listings will only contain the denomination and Scott catalog number. The two documentary stamps issued between 1962 and 1963, which are a different design, will be included at the end of THIS PAGE. 1940 -- Overprinted "Series 1940"
0030 D. (Sc. #R306) - Thomas Corwin (1794-1865) - Secretary of the Treasury (1850-1853). 0050 D. (Sc. #R306A) - James Guthrie (1792-1869) - Secretary of the Treasury (1853-1857). 0060 D. (Sc. #R307) - Howell Cobb (1815-1868) - Secretary of the Treasury (1857-1860). 0100 D. (Sc. #R308) - Philip F. Thomas (1810-1890) - Secretary of the Treasury (1860-1861). 0500 D. (Sc. #R309) - John A. Dix (1798-1879) - Secretary of the Treasury (1861). 1000 D. (Sc. #R309) - Salmon P. Chase (1808-1873) - Secretary of the Treasury (1861-1864). 1941 -- Overprinted "Series 1941"
1942 -- Overprinted "Series 1942"
1943 -- Overprinted "Series 1943"
1944 -- Overprinted "Series 1944"
1945 -- Overprinted "Series 1945"
1946 -- Overprinted "Series 1946"
1947 -- Overprinted "Series 1947"
1948 -- Overprinted "Series 1948"
1949 -- Overprinted "Series 1949"
1950 -- Overprinted "Series 1950"
1951 -- Overprinted "Series 1951"
1952 -- Overprinted "Series 1952"
02500 D. (1952 - Sc. #R617) - William Windom (1827-1891) - Secretary of the Treasury (1889-1891). 05000 D. (1952 - Sc. #R618) - Charles J. Folger (1818-1884) - Secretary of the Treasury (1881-1884). 10000 D. (1952 - Sc. #R619) - Walter Q. Gresham (1832-1895) - Secretary of the Treasury (1884). 1953 -- Overprinted "Series 1953"
1954 -- Overprinted "Series 1954"
1955 -- Overprinted "Series 1955"
1956 -- Overprinted "Series 1956"
1957 -- Overprinted "Series 1957"
1958 -- Overprinted "Series 1958"
The 10 C. denomination documentary stamp shown above, at the top (Sc. #R733), was issued on July 2, 1962 to commemorate the 100th Anniversary of the Internal Revenue Service. The design features the Internal Revenue Building in Washington, D.C. The 10 C. denomination documentary stamp shown above, at the bottom (Sc. #R734), was issued in 1963, to be used as a regular documentary revenue stamp. The inscription "Established 1862" has been removed from the design of this stamp. 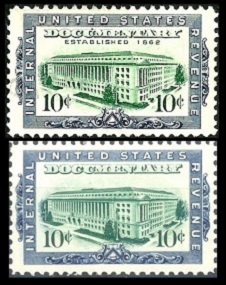 The use of documentary revenue stamps was discontinued on December 31, 1967.